Even before the MediaCorp sitcom 80's Rewind won a silver world medal for situation comedy at the 2009 New York Festivals, Channel 5 was already working on the sequel called '90s Rewind. Except it wasn't just a TV series, but a series of local TV shows bearing remarkable resemblence to old Channel 5 programmes from the '90s. Even the channel's new tagline "Come Home to 5", launched in May 2008, was resurrected from the decade that gave us the Macarena. Then, three months later in August last year, Channel 5 debuted Singapore OK, basically a revival of the '90s infotainment programme Hey, Singapore! but without the old show's dimpled host Lisa Ang, who would later become VR Man's sidekick before joining and quitting Channel News Asia. 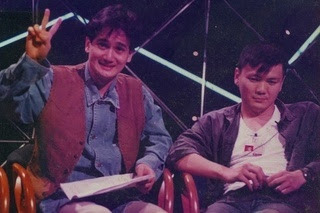 Currently on Channel 5 is the musical showcase Live 'N' Loaded that seems to have the recycled the set and production values from the 1994 variety show Live On 5, which also featured local artistes while introducing the unsuspecting world to an ex-Haw Par Villa performer named Gurmit Singh. After premiering in January in Live On 5's old Tuesday 8:30pm time slot, Live 'N' Loaded has since been relegated to the graveyard time slot of Thursday 11pm and is no longer telecast live to air. And who says we don't support local music? Recently, you may have caught the extended trailers on Channel 5 for the two upcoming dramas Red Thread, an overwrought soap opera starring Adrian Pang with a posh accent, and Fighting Spiders, set in 1960s Singapore. What does that sweeping shot of the yacht in the Red Thread trailer bring to mind? That's right, it's Masters Of The Sea all over again. What do the clips of uniformed schoolboys with "slope" haircuts in the Fighting Spiders trailer remind you of? That's right, it's Growing Up redux. If only they exhumed Triple Nine as well, it would mark the return of Singapore's first three English-language drama series on Channel 5 from the '90s. Come back, James Lye, all is forgiven (except VR Man). Is it a coincidence that Kenneth Liang who used to run Channel 5 in the '90s is currently back running the channel again? There was a time (in the '90s?) when Channel 5 would be accused of copying foreign shows - Masters Of The Sea was a copy of '80s soaps Dallas and Falcon Crest, Growing Up was a copy of The Wonder Years and Three Rooms was a copy of Friends. Nowadays, the channel can be accused of copying from itself. At least no one can accuse MediaCorp of not recycling.